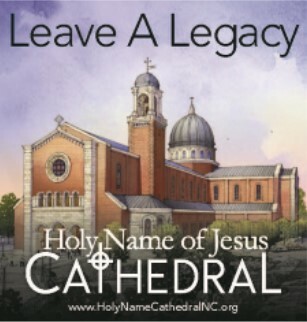 Join the faithful who are remembering loved ones with a gift to Holy Name of Jesus Cathedral. Through the honor and memorial opportunities of religious art or liturgical items, your family and loved ones will have a special place in our new cathedral for generations. Gift levels vary. Please click here to read the pastoral letter from Bishop Burbidge. Bisop Brubidge has issued a pastoral letter entitled, "Our Cathedral and a Renewed Devotion to the Holy Name of Jesus", which is available by clicking here.